Koczo won clear first by 2 points with 7.5/9. Here is his rd6 game. Black has initiated forcing play. How should black continue? Here is a tough game from rd3. Rd5 is under attack so there is not really much choice but to give up the exchange with 26.Rxb5. 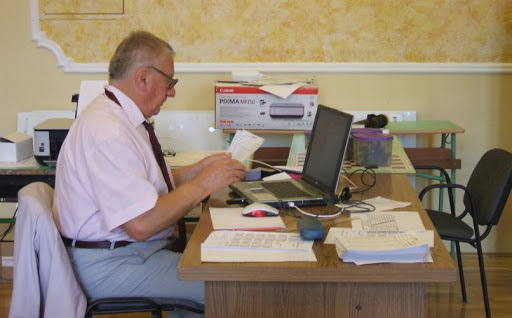 Group A-Koczo won by 2 points with 7.5/9. 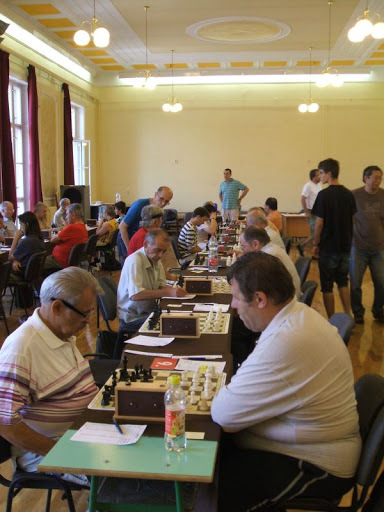 Open-Pozsonyi had an excellent tournament and finished with 8/9. 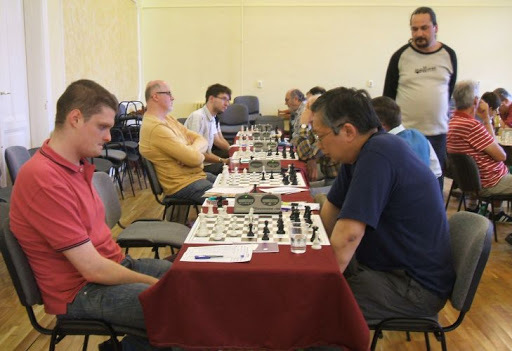 Thanks to Robert Zoldy who organized the tournament, took pictures and also played in the A group. 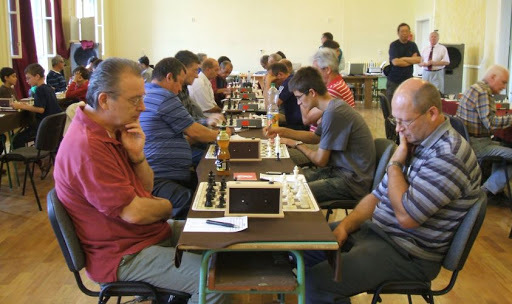 Koczo won by 2 points with 7.5/9. 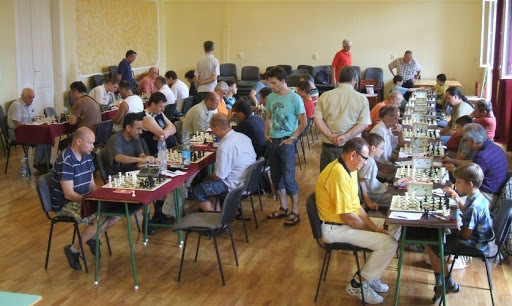 Pozsonyi had an excellent tournament and finished with 8/9. 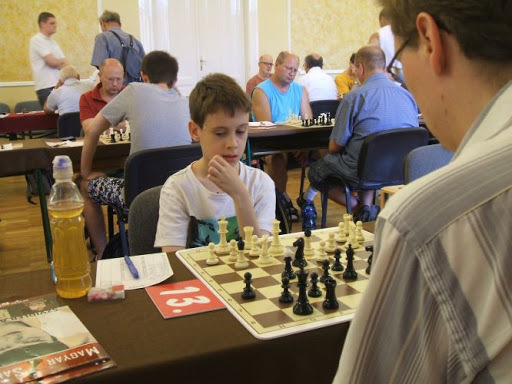 The tournament had the normal number of keen juniors getting valuable experience. I was getting crushed by Stern,T(black) who moved in for the kill with 32…Bh2, threatening ..Bg3#. In the analysis with Stern and Varga,A(who I play in rd9), I showed what I missed-33.Re8+! 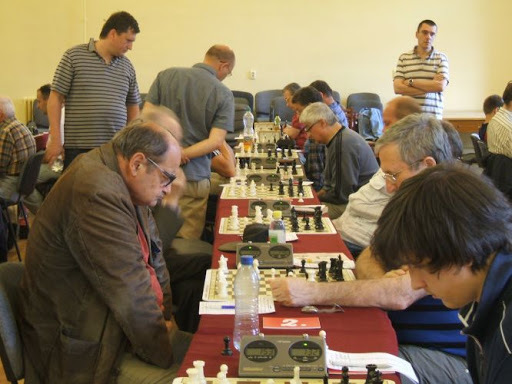 Kg7 34.Rg8+ Kxg8 35.Qe8+ Kg7 36.Bh6+!! 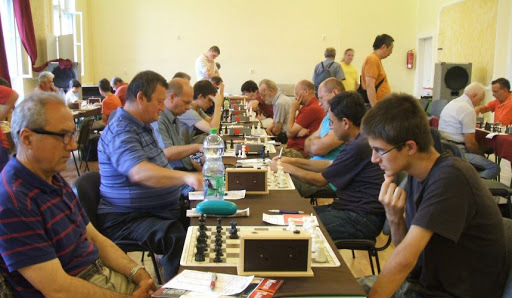 Kh6(or 36…Kf6 37.Qd8#) 37.Qf8#. Too bad. Now my tactics have improved to the point where I can see things a bit too late. I lost my third game in a row(rather sadly) as I have become my own worst enemy. 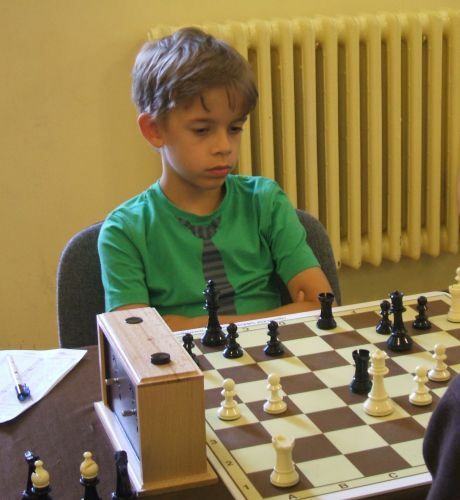 My opponent beat me in the same tournament last year with the same opening(1.c4) and just had his birthday-so Happy Birthday Aron. Here is my round 5 game. Both players missed 12..f4 with the idea of 13.ef or 13.gf then 13…g4! and Nh3 is out of squares. Otherwise the idea is 13…f3 forking Qe2/Bg2. Koczo shares the lead with Bodrogi,M with 3/4. Koczo beat me in the last game to finish from a bad position. I finally faded in the long RB-RB ending. 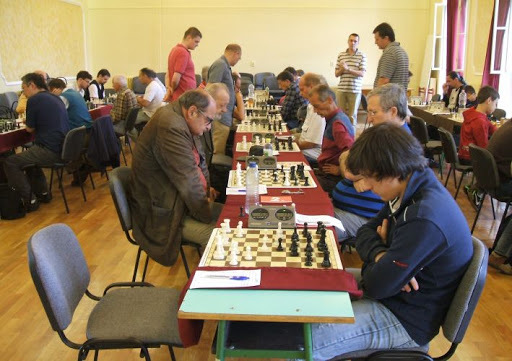 My early middlegame position was quite promising after 20…Rd8 but I did not play 21.e4! I pushed hard with 35.f6 and thought I had a crushing position but it was not as good as I thought. I won a pawn but then retreated with 38.Rf3= instead of 38.Rf6 with an advantage. I kept pressing for the win but tried a bit too hard and lost. 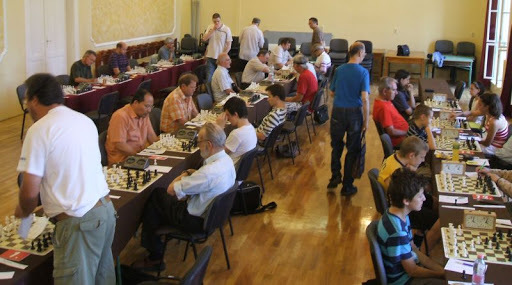 Pozsonyi is in clear first with 4/4. Here is my rd4 game with Koczo. I won a pawn but could not find the winning idea and finally drew my game with Kormos,A. I won a pawn in the middlegame with some sharp play and reached a clearly better ending after 30…e4. Play continued with 31.Rd2!? but my technique could not bring home the point. I have a choice of king moves after 57…Ne8+ but did not find 58.Ke7 or 58.Ke6 both winning with the Nxg6+ idea. I played 58.Ke5? and conceded a draw. Koczo had a good position from the opening but had to fight for a draw in a R-R ending against Varga,Z eventually holding a theoretical drawn Philidor position. 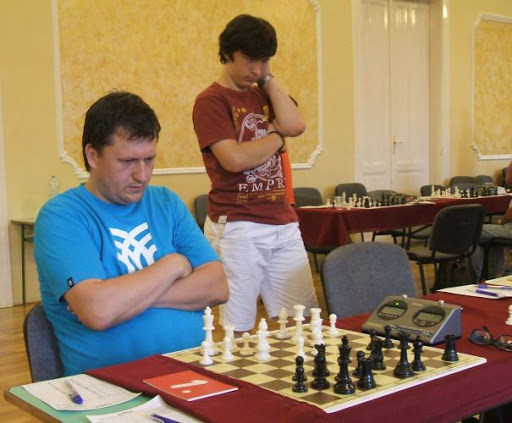 Bodrogi,L opened with 1.b3 against Bodrogi,M but eventually was ground down in a RN-RB ending. 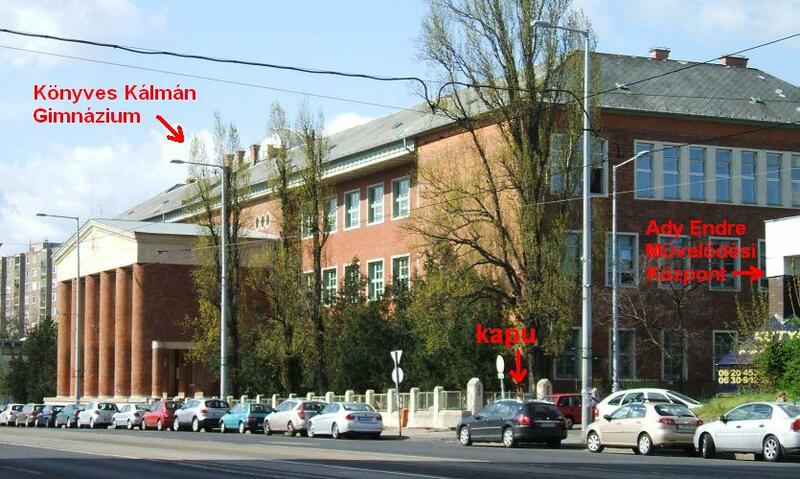 Juhasz,B faced the Tarrasch Defence from Zoldy and prevailed. 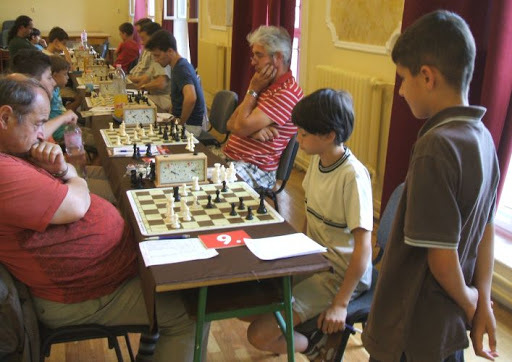 Nagy,Aron defended the 3.Bb5+ Bd7 Sicilian and won. Nagy,A is in a group of 5 with the lead at 1.5/2. Bartuszek,A shares the lead with 3 others on 2/2. I got off to a good start, but Houdini assures me I played quite weakly. Bodrogi,L had a good position but tried too hard to force the play and eventually gave a piece up.